Ogunquit - Perkins Cove and Marginal Way - 3 bedroom! Walk into Perkins Cove for coffee and pastry in the morning and dinner at night!! Property Size 1,755 sq. ft.
*NOTE: The "Total Price" in the Instant Quote box includes your REFUNDABLE security deposit ranging of $400, the 9% Maine State Lodging Tax, and any applicable fees. Terrific 3 bedroom. Two ground floor bedrooms and two ground floor baths. Entire 2nd floor of Cape style house is 3rd bedroom with 1/2 bath. Private-yard on private road near Perkins Cove. FENCED-IN back yard. Crisp & Clean. Nicely appointed. Very comfortable. 3 Air Conditioning Units. Near Marginal Way . Patio & grill. LINENS INCLUDED. Laundry Larger than it looks! 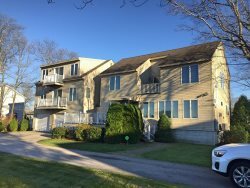 Love this rental, The location is fabulous with easy short walk to either Perkins Cove and or Marginal Way, trolley into town and or beach. Great space to enjoy large groups and plenty of space for sleeping. The upstairs bedroom is more like 2 bedrooms and sleeps 5 Comfortably. With the fenced in yard, little ones are free to roam in safety. Great beachy decor, very clean! We will be back! Beautiful Place by the Sea!